Hey Friends! It’s party time! We’re working hard over here with so many different recipes and we realized that we need to have more cocktail recipes. 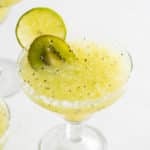 So one of the first things on our mind was margaritas and since we had a ton of ripe kiwi sitting on the counter, it was definitely time to work on a blended kiwi margarita recipe for you guys. 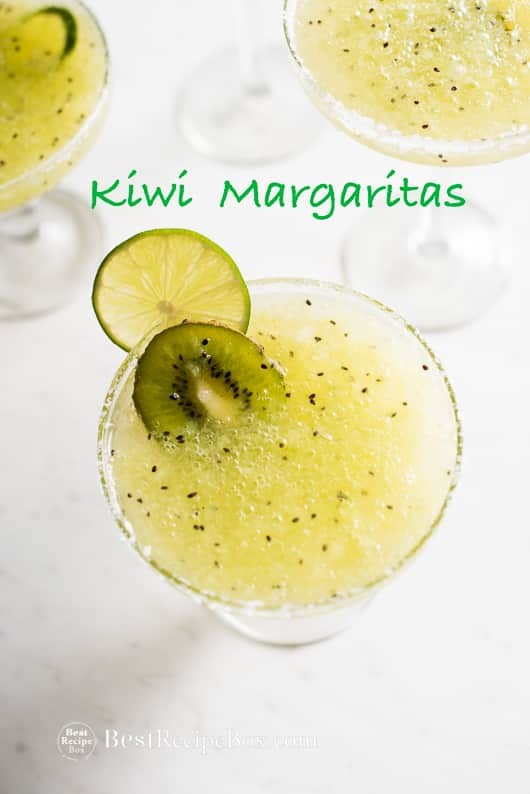 It’s not just any regular recipe for kiwi margaritas, it’s a party recipe! Sure, the volume is larger, making 4 kiwi margaritas. So it can be for you and 3 friends, or for you and another friend (2 margaritas each) or all for you if you want to party by yourself. Hey, however many people you are serving it’s definitely a drink that will put you in good spirits because not only is it delicious, it’s super pretty too. 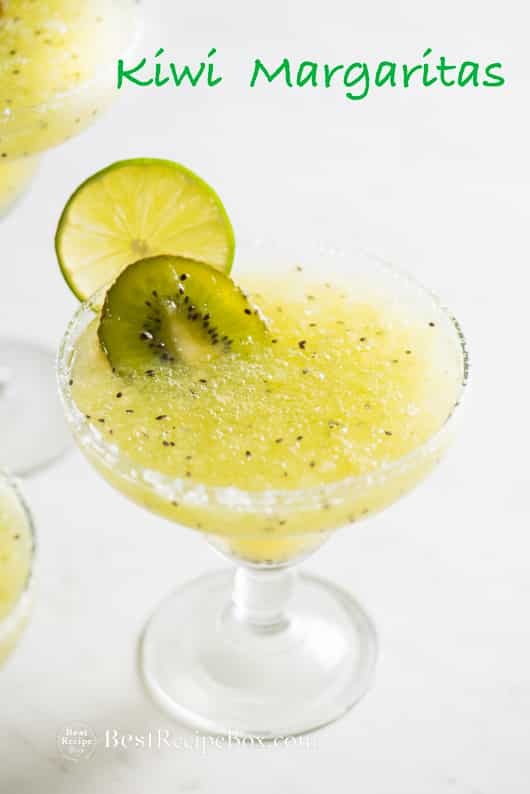 Best suggestion we can give you to make this margarita recipe awesome is to use really ripe kiwis. The riper the kiwis, the better and sweeter the flavor. We’ll usually wait to let them become super soft and then we know they’ll be ready for the margaritas. Serve them at your party and you’ll be the hit of the party. The recipe easily doubles. The video above is proof. That was a double batch being made of the kiwi margaritas because it was a Friday and everyone wanted their fair share to taste. Our tasters were split on how they liked it. Some preferred the kiwi margaritas with orange liqueur others liked it with simple syrup and orange bitters. There are both options in the recipe below. Just check the head note if you want to try the orange bitters version. The riper the kiwis, the better tasting this margarita will be. We'll let the kiwis ripen until they're super soft and sweeter. This recipe easily doubles for big parties! You can also substitute the orange liqueur and sugar with a 1/3 cup (60ml) of simple syrup and several hearty dashes of orange bitters if you prefer. The ice amount will vary depending on how big your ice cubes are. It is best to start with less ice and add more to reach your desired consistency. Rub the rims of the glasses with a lime or kiwi slice. Make a small pile of flaky salt and rim the glasses with salt. In a blender combine the kiwi, tequila, orange liqueur, lime juice, sugar, and ice *see head note. Blend until no large chunks of ice remain. Serve and garnish in salt-rimmed glasses.